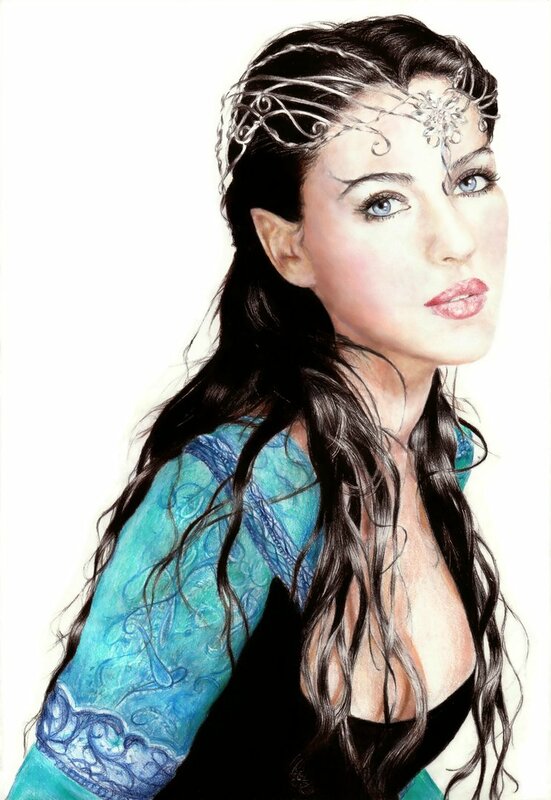 Minas Tirith Forums: Regarding Beren and Luthien - Did Luthein just bail out Beren? Author Topic: Regarding Beren and Luthien - Did Luthein just bail out Beren? Except for the expression on her face! Definitely lacks grace and royal composure. The first one reproduced above was awful beyond decription. Don't think much of the second one either, I'm afraid. Why the Vulcan ears and the buck teeth, not to mention the nasty expression? The dress is vulgar too. Whereas the light perceives the very heart of the darkness, its own secret has not been discovered. Say, how do you post a pic in your message? I have an image I drew that I would like to show but I don't know how to post it. From the play, "Gross Indecencies: The Three Trials of Oscar Wilde"
Annatar, first, if its in electronic format like jpg or gif, then go to Facelink and open a page turning on the privacy selections and upload your image to the page. Then copy the image's facelink url (right mouse click, properties, highlight URL, Ctrl C) and go to your post and put [img ] then paste (Ctrl V) the URL address and then put [/img ]. That should work. Hello from eleven years ago. LOTR! And hello to you! Not that I was about 10 years ago. And as regards the threat, not that anyone there is still here I expect, but I have often thought that Luthien does do a bit more than Beren does in the quest for the Silmaril. The faces on the two pics of Luthien are just wrong. Sure, she may have danced nearly naked, or had a beautiflu black gown on with the glint of stars in it, but gawd enough with the overly spiked vulcan ears on elves. And that black starred gown pic has her skin and face looking like she is overly aged to be the morning star. It was the second age of her life I think. Perhaps she hadn't put on the leaf make-up yet! Blue was her raiment as the unclouded heaven, but her eyes were grey as the starlit evening; her mantle was sewn with golden flowers, but her hair was dark as the shadows of twilight. The other two posted in this thread are wierd at best. The only thing missing from the first pic is a pole. And what's with Beren Hood? Lost your Merry Men? That's not even close to what I imagined Beren looking like. What source states that? Oh. That was that pure speculation? That is modelled on Monica Bellucci, no? I'll get Lilli, seeing her girlcrush as an elf will probably make her ovaries explode. I have to admit that both pics look like Luthien has just emerged from the shower!